RT Good currently serves as dean for the College of Business and Management at Lynn University, Boca Raton Florida, and as an Ideas for Action partner. 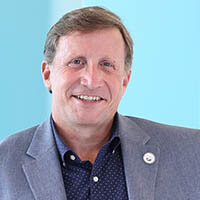 Good has extensive experience in the corporate, non-profit and government sectors as an executive leader, consultant and educator, with particular depth in higher education, where he has served for over 25 years in many executive leadership roles spanning academic affairs, student affairs, business affairs and institution-wide leadership. Good has a strong background in business and non-profit management, having served in multiple deanships, including for colleges of business and continuing education, for-profit (land development and hospitality) and non-profit (arts and environmental conservation) organizations. Good has a strong belief in the power of higher education to transform lives and knows that this results from both progressive career preparation as well as the broad, liberal learning that informs living a life of consequence. Good is a gifted strategist, leveraging distinctive competencies to realize forward-leaning aspirations – in partnership with both organizations and individuals. Clients and colleagues appreciate his ability to listen deeply, to facilitate intentional introspection for identifying strengths, to integrate disparate perspectives and functions as well as to leverage real-world capacity to make an impact. As an effective collaborator and team player, he has honed his ability to engage in “deep dive” conversations, with the requisite analytical skills to transform revelations into strategic initiatives. With corporate, government and non-profit experience, he is particularly effective in merging blue-sky thinking with real-world practicality. Good is able to transcend convention to blaze new paths, and to guide others in doing the same. Good believes that learning changes lives for the better and that his role is to facilitate learning regardless of position—constructing positive environments and systems for learning as an executive leader or consultant; inspiring imaginations and capacity for learners as an educator or challenging himself and colleagues as continuous learners. In all of these roles, he is a proponent for stimulating a collaborative learning community—seeking a better world and future. He loves the cultures of the world and hopes to synthesize pluralistic perspectives with contemplative wisdom. For him, it is a calling and he seeks to inspire and engage with others for synergistic gain. Good is an internationally-recognized leader in the areas of human resources, organizational development, design/innovative/entrepreneurial thinking and strategy. He holds professional certifications from the Society for Human Resource Management, Senior Certified Professional (SHRM-SCP); Senior Professional in Human Resources (SPHR); and Global Professional in Human Resources (GPHR). Good is also an authorized Highlands Ability Battery consultant and career coach. A published scholar in academic journals and edited texts, Good has also been a featured speaker in local, national and international professional forums. With a particular affinity for international education, Good has taught in or led study programs to 67 countries. He has consulted on and led assessment/accreditation projects for the U.S. Departments of State, Defense, Education as well as Health and Human Services. Good has been recognized nationally for outstanding projects in diversity and inclusion by the National Association for Campus Activities, locally as a top influencer in business by the greater Boca Raton Chamber of Commerce in Florida, and professionally having been granted professor emeritus status with Shenandoah University. Good holds a post-doctorate in international business and entrepreneurship from the University of Florida; a doctorate in education with specialization in higher education and concentration in human resources from Nova Southeastern University; an MBA from the University of Mary Washington; and a bachelor’s in arts management with a minor in dance from Virginia Commonwealth University. Good is also an ordained member of the clergy with the Order of the Boundless Way in the tradition of the Mugendo Zen Kai.